Thank you, for all your assistance over the past few months. You are all the tops in our books. I can't tell you how much Sapphire have done for us, before and after the completion. John has been a diamond. They don't forget you once the completion has gone through, they are on hand to recommend everything from restaurants and quality workmen. John even drove us around the area pointing out various shops and restaurants etc. Seriously if you are looking for a top quality, honest, friendly and professional estate agent you can't go wrong with Sapphire. I can't thank John, Sue and the rest of the gang enough. A huge big Thank You to John and the Team at Sapphire Properties. Christine from the start was extremely helpful on the telephone and emails with updates of properties. Thanks to Mark for showing us the property which we purchased. His showed excellent knowledge, extremely helpful and courteous throughout the house purchase especially all the legalities as we were on a time limit to go back to the UK. We would not think twice about using their services and recommending Sapphire Properties in the future. A big thank you to yourself and Sapphire for your help in our transition to Spain. Also if required I wouldn't hesitate in returning to you or recommending the company. Can Erica and myself just say a massive big THANK YOU . 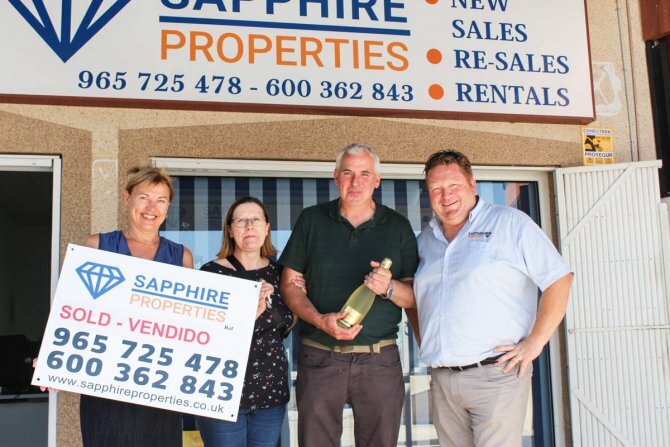 We are so happy with our move to Spain, which was so possible with the help from everybody at Sapphire Properties. We would not have a problem telling anybody that you are the main property agents to use in buying property in Spain . An extra thank you to Mark for a 5 star treatment that he provided for us . Thank you John and Cindy for the contacts that you gave us, as all the furniture has been collected and we now have the internet . We can't thank John and all the team enough not only for the house sale (which was sold in just 24 hours ! ) but for all the help and advice for months afterwards . This is a very friendly and professional team and we would recommend them to anyone who is thinking of buying or selling in the Costa Blanca area . We feel that they are never unwilling to help us in any way they can . We really cant thank you all enough. From the first viewing of the property to collecting the keys, everything was superb, and the bottle of bubbly was a bonus! At last - very professional. Description well constructed and explains the area of the villa, all the features and additions. Even we found it interesting! Just a quick note to say thank you so much for helping us find the apartment of our dreams. Thank you for all your help and support over the last few months. We are moving in to our new home today and we appreciate everything that you have done from start to finish. Aah, no problem, FABULOUS and thank you! I do appreciate that you have been doing 'this' for 12 years and I also believe that John fully appreciates what you do for his business, but I want to tell you that Kevin and I think you are GREAT. YOU have made this whole process so painless for us and you have been SO supportive. Nothing and I mean nothing was too much trouble for these guys to handle for us. 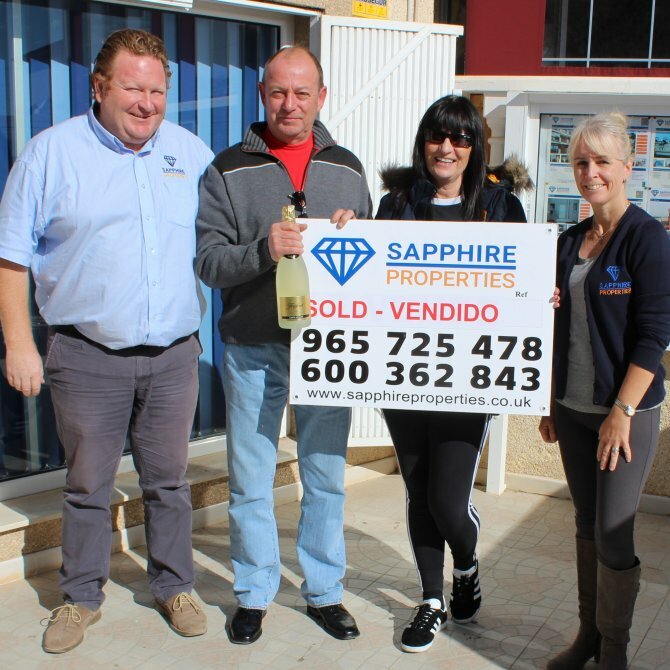 If you are looking to buy a property in the Alicante area, well look no further than these guys…..
We cannot thank the staff of Sapphire enough for finding us our dream property, from Cindy who found us lots of properties even when we kept changing our criteria, to Mark who drove us to all the properties we wanted to see, to John who kept us calm during the negotiations and last, but not least Christine who always had a smile when we came to the office. Professional, patient, organised are only some of the words we could use. Cannot recommend them enough. Pat, Triona, Justine & Moya Dempsey. My mum has asked me a few times to write a review for Mark, to thank him for all of his hard work and effort in helping her to view and buy the property. So I do apologise for a late reply, work was very busy and with Christmas coming, it was hard to do it as soon as she came back. But what she wanted to say is that she is incredibly thankful for both you and Mark in helping her to arrange accommodation for the viewing trip, and help her to view properties, seeing as her budget was relatively lower than most people go for. 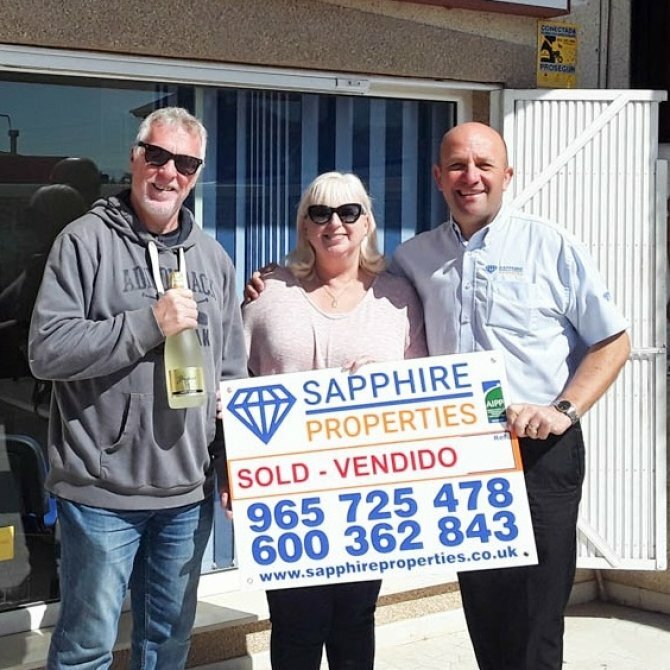 She also wanted to say that Mark’s help has been exceptional and that he helped her to understand the location and environment of where the property is based well, and went out of his way to show her and her friend around, as well as showing her the Guardamar beach. Both me and her wanted to thank you for your handwork as well, and I wanted to thank you for getting back to me so quickly about everything, as this was a very new experience for me as well, and it was a bit difficult that I could not go and view with my mum, but you made everything very clear, convenient and reassuring as well as giving me the peace of mind and taking care of her needs. I also want to thank you for taking the time to explain everything to my mum and making sure that she understands everything as language could have been a bit of an issue for her. 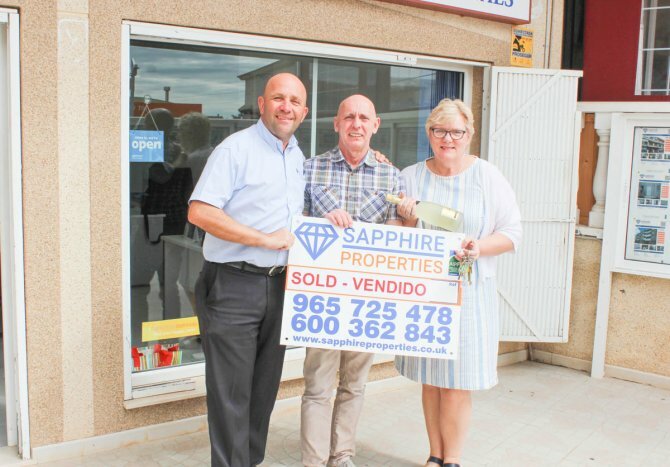 Thank you for all that you’ve done to help us in this journey of buying a property in Spain, and if me and my mum come across anyone who are interested in buying in Spain, we shall definitely recommend Sapphire properties to them! Merry Christmas and have a happy holiday! Thank you so much for all your help and patience. Purchasing a property in Spain can be very stressful, however, not if you purchase through Sapphire Properties. From meeting Mark Allan at the airport, we explained exactly what we wanted and yes Sapphire delivered finding us our perfect property.!! They are English owned estate agents, with some of their team speaking fluent Spanish their customer services is exceptional and they are with you all step of the way. Big thank you to all staff but especially Mark and Cindy without doubt we would recommend your company to anyone who is wishing to fill their dream. It was a pleasure to talk to you today and I very much appreciate your phone call and emails. Both Mary and I look forward to meeting with you in March. Thanks again to everyone for your help, we really appreciated it. Well having lived in cloud cuckoo land for 13 years, plodding along enjoying a sun filled life, we have now been thrown into the hurly, burly land of selling our dream home in Crevellente. The process of visit, inspection, photographs, valuation,contracts and placing the property on line was completed expertly by Kristina, and all in a matter of days. We could not recommend them highly enough, and they were a breath of fresh air! Nicky and I would like to extend our sincere thanks and gratitude for the amazing service you afforded us during our search for a property in Spain. Brad looked after us and he expounded your ethos perfectly. When we contacted Christine initially she told me that their goal was not just to find us a property that we were happy with, but to find us a home we would be delighted with. 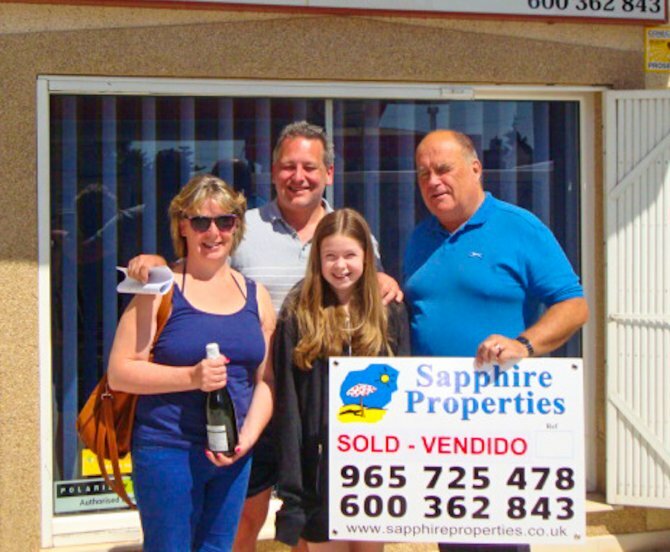 Sapphire listened to everything thing we said and went the extra mile to ensure they found the perfect property for US! We could not recommend them highly enough, and they were a breath of fresh air after some less than satisfying agencies. We felt comfortable and knew Brad was listening to us and within a single day we had found our dream home in Spain. The after sales care is also second to none and we will be forever grateful to the whole Sapphire team for their friendly and professional care and attention. You really know how to make people smile, and for us it meant a lot, plus you found us our ideal home. We would like to say a big THANK YOU for helping us find a property, if it was not for you we would not have found a property. The help that was given by Peter was excellent, he is an asset to your company. 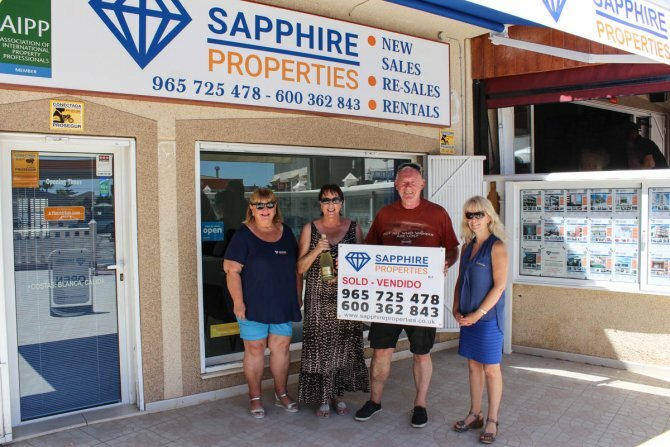 We would certainly recommend Sapphire Properties to all our family and friends. Thank you for handling the sale of our Spanish property so quickly and efficiently, it was a pleasure to do business with you and your company and we wish you all the best for the future. I felt totally at ease and confident with Sapphire, and would have no problem recommending them to anyone. I am from Norway where the temperature is somewhat different to Spain, and I had decided this is where I wanted to be. 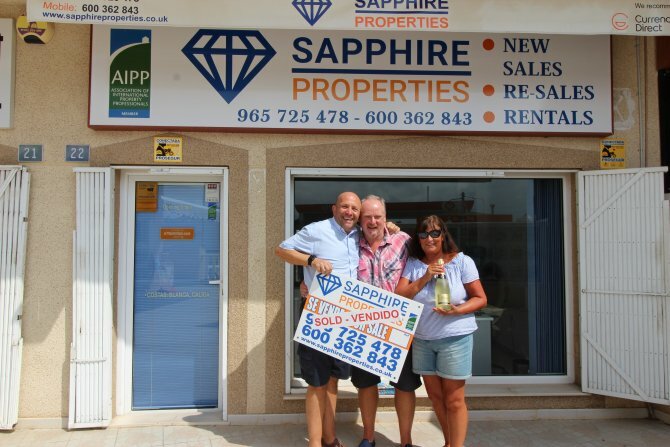 We had been searching the website looking at areas and properties in Spain, at this point I viewed a number of agents and one of those was Sapphire Properties. I decided to call Sapphire and spoke to a lady called Christine who I found to be most helpful, polite and friendly. She was very informative and nothing was too much trouble. Christine sent me a number of properties for me to consider initially. At this point I thought the Lola style property was my preferred choice. Christine encouraged me to visit the office and she would arrange for me to be shown the area and other property options, Christine´s total re-assurance was one of the reasons I decided to visit Sapphire. It was lovely to meet Christine and the team, and to be introduced to Peter. I spent a week in Peter´s company and with his help, knowledge and guidance I found that my ideal property, which turned out to be a semi-detached villa. During my time spent with Peter we became firm friends, so much so that it felt natural to ask Peter to be my best man at my forthcoming wedding, which I am pleased to say he accepted. Thank you for helping us to find our amazing home in the sun and for the extremely helpful and professional after sales service. I would have no hesitation in recomending your company very highly. Thank you for helping us finding our BEAUTIFUL HOME. Thank you for all your assistance and for our lovely week we had staying in Spain. Can´t wait to join you all in the little village. I would also like to recommend Sapphire Properties estate agent. Even though we didn't in the end buy our property though them I must say John and his team were very helpful and more than happy that we found what we wanted through another agent ,even helping with pointing us in the right directions when we needed help. You always here about the negative side of some agents so I felt it only right to pass on our positive dealings. Thank you for all you have done for us, showing us around and also finding a property we love. Hope to meet you again in July. Thank you all for your help in finding us our villa, see you all again in July. Sorry John i couldn´t find any golf balls to buy you. We would like to say thank you for your help in finding our new house in Spain. Here is our testimonial for your website. 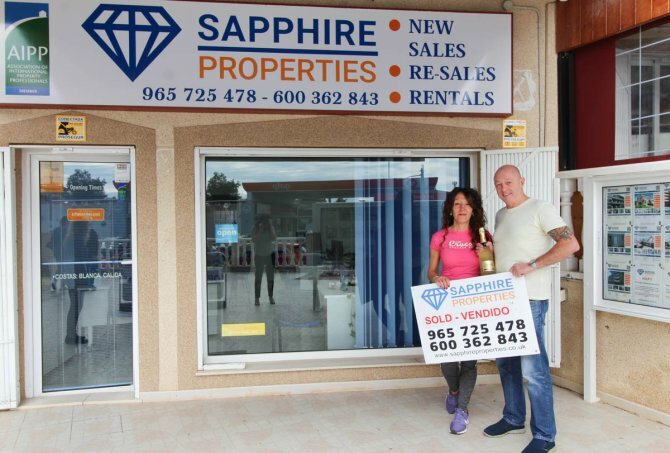 "We used Sapphire Properties to purchase our villa in Quesada. We would highly recommend Peter Taylor who spent lots of time looking after us, showing us Quesada and helping to find our dream house. Once we made our choice, Sapphire organized meetings with the bank, lawyer and notary - we just came in and signed papers. Everything went smoothly, no stress or problems. Sapphire is a professionals, extremely helpful and friendly. Highly recommend!" we would definitely recommend your agency to our friends, colleagues and relatives. May I add that David was very helpful in our property search and we would definitely recommend your agency to our friends, colleagues and relatives. Just a short note, to say thank you so much for going above and beyond to make our property purchase not only easy but a pleasurable experience! We are so glad we chose Sapphire, the service is second to none, from the moment Cindy contacted us to the minute Pete collected us from the airport, through to the stress free completion. We would whole heartedly recommend you to anyone purchasing a property in Spain. Many thanks for all your help. We could not have asked for more. If it wasn't for Sapphire Properties we would probably have returned home without seeing the home we had hoped for. Just a few words of thanks to you and all your team at Sapphire Properties for looking after myself and Liz on our recent house hunting expedition. As you know, your colleague Peter took us out to view a number of properties last Friday in the Quesada area, this was after spending the previous 4 days visiting over 25 properties in various regions with 4 other agents, which we found to be extremely exhausting and disappointing, to say the very least, as the calibre of properties they showed us, did not meet up with our expectations, far from it. It truly was a far more enjoyable experience spending Friday with Peter in the Quesada area, an area that other agents had told us to avoid.Thank goodness we did not listen to the other agents and instead gave Peter the opportunity to show us what he had available in Quesada that matched our remit. What a difference from the previous 4 days, Peter soon demonstrated that he had "taken on board" our requirements and took us to see several properties that he felt would be in contention to become our new home. However, not only did Peter take us to view properties, he took us in and around Quesada in order to give us a feel for the whole area as we did not know the area. Within a short time Liz and I both new that Quesada was the place we wanted to live, and not only that, Peter also found us a lovely home in a lovely, quiet area of the town. We are both absolutely delighted that we have had our offer for the house accepted and are looking forward to making our permanent move to Quesada within the next 3 weeks. Please pass on our best wishes to everyone of your professional team, especially Peter, who has gone way beyond just "doing his job" by showing us around various areas of Quesada during his day off. It truly is unbelievable, that not only have we found our new home we have also found new friends yourself and staff included. Many thanks again John to you and all your team, Best wishes, Ivan & Liz. Hope you are well and enjoying warm sunshine. It’s been cold, wet, snowy, windy and now sunny here. Thank you very much indeed for all your help, advice and kindness turning what could have been a very difficult and problematic week into an absolute pleasure. You made the whole process very easy, were a font information and helped us clarify our needs and priorities. Thanks too for sorting out the door lock when I managed to lock us out of the appartment in Rafal. We really enjoyed our evening meal with you and to cap it all you found us a superb house. We can’t thank you enough. We can’t stop smiling. Please pass on our thanks to John and the team and to Christine in particular who made all the arrangements for our viewings etc. We intend to come back to Quesada in February or March to assess what we need for the house and catch up with you. Thanks for everything! Take care. Thank you for all your help finding our dream place in the sun, nothing was too much trouble. 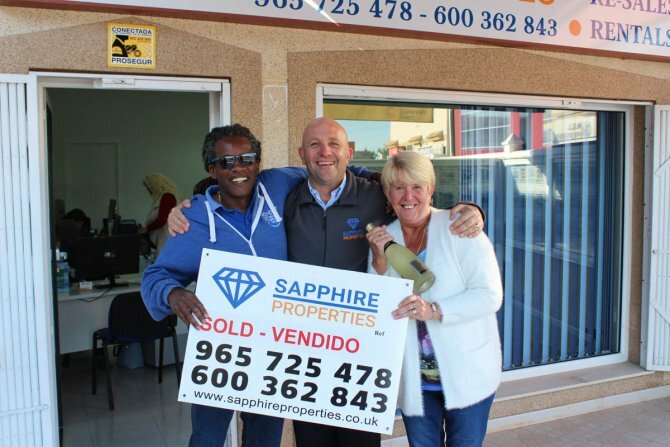 When we started to look for a property in Spain, we contacted several estate agents, but chose Sapphire Properties due to the friendly staff. Our relationship with Cindy, in particular, has developed into a friendship even after we have bought our holiday home. The service we have received from all the staff has been faultless, from setting up the viewing trip, showing us around properties, guiding us through the buying process, and dealing with the legalities such as banks, solicitors, and insurances. 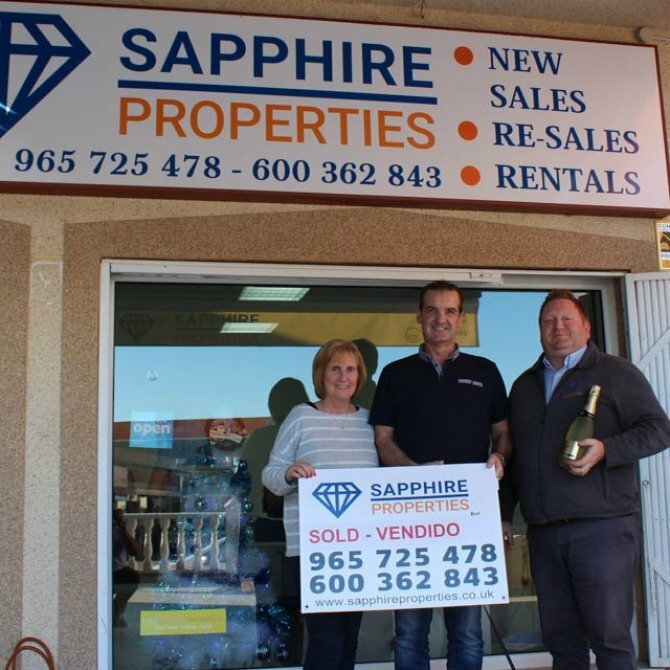 When we have needed help or advise, Sapphire Properties have never failed us, and even now, whenever we are in Quesada we make a point of nipping into the office to say Hello. We have recommended Sapphire Properties to some friends who are interested in buying a Spanish property, and certainly use them again. P.S. Steve ordered the Box - thank you for helping. As we have just returned home to the UK after an enjoyable and successful trip to find our dream retirement home, we wanted to express our thanks and gratitude for the warm welcome, help and guidance given to us by you and your team. We had spent a few years planning and looking for a property in the area for our retirement home, we visited the region and looked at various areas on each visit, so were pleased to find a company that knew the market and region so well. Nothing was too much trouble, the help you gave us in finding and opening a bank account, and a fantastic English speaking Lawyer was invaluable. You delayed a family event because we wanted to view more properties one particular day , and even gave us a lift back to the airport on departure day! So a big big thank you once again from us ! You have our telephone numbers, we would pleased to speak to anyone who would like to talk to us about your services. Sorry I have not got back to you before but thanks for a great job finding a buyer for my villa. Regards to you all at Sapphire. Fulfill your dreams with Sapphire Properties! Last year we bought our dream home in Spain. One thing I am sure of is that we would not have found the perfect house, in the right area, so quickly, without professional help from a serious company like Sapphire properties. Not everyone has had the same experience as us, that we know for sure. The team were really just great all the way, giving us breathing space, no pressure, and telling us to take time to think it over. They were quick at understanding what we were looking for, and good at finding the right houses to see. After the takeover in November, we still had some questions about different things that pop up, and SAPPHIRE has always been there for us if we needed help with something we didn’t understand. So to all you who are considering buying a dream place: BUY SAFELY WITH SAPPHIRE PROPERTIES! We can guarantee you will be pleased with your choice of broker. Oppfyll dine drømmer med Sapphire properties! I fjor kjøpte vi vårt drømmehus i Spania. En ting jeg er sikker på er at vi ikke ville funnet det perfekte huset, i det rette området, så fort, uten profesjonell hjelp fra et seriøst firma som Sapphire properties. Ikke alle har hatt samme opplevelse som oss, det er helt sikkert. Allan var virkelig helt topp hele veien, han gav oss pusterom, presset ikke på, og han var opptatt av at vi tok oss tid til å tenke. Han forstod fort hva vi var ute etter, og var flink til å finne de rette husene å se på. Etter overtagelsen i november har vi stadig hatt noen spørsmål om forskjellige ting som dukker opp, og Allan har aldri vært vanskelig å be om hjelp. Så til alle dere som vurderer å kjøpe et drømmested. KJØP TRYGT MED SAPPHIRE PROPERTIES. Vi kan garantere at dere blir fornøy med valg av megler. A daunting task, was managed so well and so fast. Just a quick note to say many thanks for your totally invaluable help, kindness, professionalism and patience with my property purchase.I have already recommended your services to two of my friends, who, knowing me as they do, were so surprised that what at first seemed quite a daunting task, was managed so well and so fast. My thanks somehow seem quite inadequate but are very sincere.If ever I can return your help, please do not hesitate to ask. We thank you for the wonderful work you have done for us. We are very happy in our new home! We found the whole experience to be an immense pleasure. 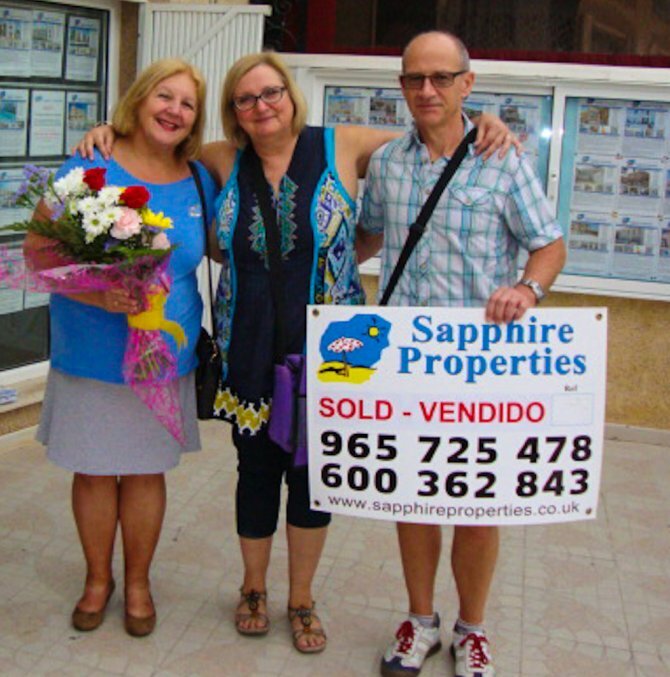 My husband and I have no hesitation in recommending Sapphire properties to any one who is considering the purchase of a property on the Costa Blanca. Having purchased our property from Plan, in November 2001, we were highly delighted with the friendly and efficient service, provided by the company. Nothing was too much trouble for them, from meeting us at the airport, to taking us to open bank accounts, and making appointments for us to meet with the Notary. They even took us to view furniture stores so that we could get a feel for what packages were on offer. We were taken to view a selection of properties which fulfilled our personal requirements,and which were also within our price range. We felt that we were able to view each property for as long as we wanted to. There was no pressure to rush us onto a next viewing. We are now the proud owners of our dream home in the sun, and are counting the days until we can finally retire and spend most of the year in our perfect ideal home. More recently Sapphire also provided a similar, high quality service, for our daughter and her husband. 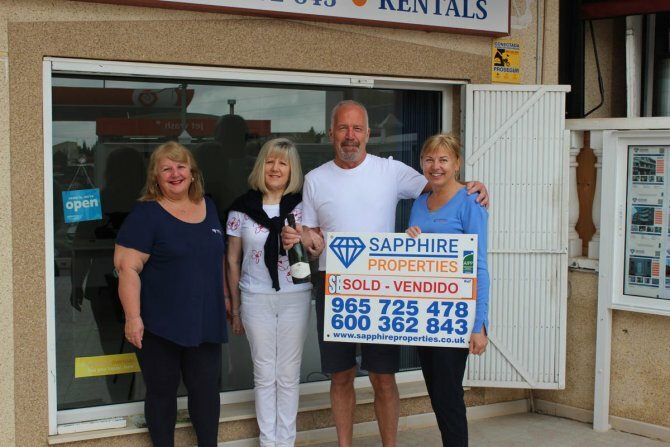 They too were more than satisfied with the service provided, and are now proud owners of an apartment at Playa Flamenca. Just a quick note to thank you for all your help last week, we couldn’t believe how relaxed and easy you made things for us, it was a real pleasure to receive your advice and guidance and we can’t wait for next year. Hope to see you when we are next over. I hope this finds you well, just a short note to thank you for the sale of the house which went through, but especially for introducing us to Marie Carmen who has been the most helpful person we have had the pleasure to deal with in Spain, nothing seems too much trouble to her and we would recommend both hers and your services to anyone. Once again thanks to all concerned. 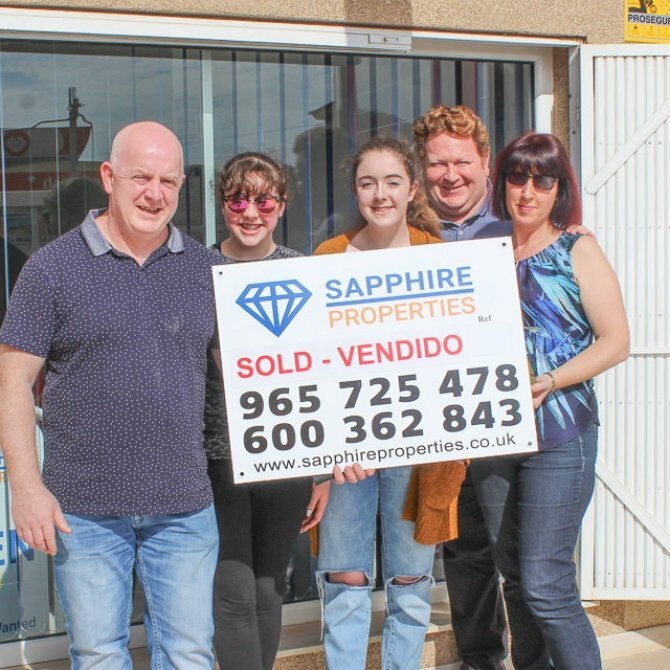 I would like to thank everyone at Sapphire Properties for the expertise and help in securing a lovely property just on the outskirts of Quesada. The whole experience was dealt with very professionally and nothing was ever too much trouble. If you want to deal with a professional company, who really do know how to treat people, then I would recommend the team at Sapphire without hesitation. My wife and I had planned to purchase a property in Spain and we attended several property exhibitions in the UK however the only company that showed real interest in what WE wanted were Sapphire Properties. We were quite determined that we would buy a property that fulfilled our requirements and we were delighted that when we did our inspection tour the properties on offer were as we had requested. We purchased a property whilst on the tour as we felt at ease with the honesty and integrity shown by the company and at no time was there any hint of pressure and the after sales department has been first class. It is a little worrying to put your trust in someone in a different country but I would have no hesitation in recommending Sapphire to any potential purchaser, the whole transaction could not have gone smoother or easier. We are really chuffed and the location of our apartment is fabulous. Really happy with the whole experience. It was our first visit to mainland Spain and after a week we felt as though we knew the place and it was all thanks to the team at Sapphire. The were very patient and nothing was too much trouble. We never expected to buy a property on the first visit, but with the guidance and knowledge we felt quite at ease to do so. We can assure you we will highly recommend you to all our aquaintances. Just wanted to say thanks once again to you and all of Sapphire Properties for everything. I was quite impressed with the professionalism and authentic desire to answer all my questions and ensure my purchase went well. No matter how many times we travel or how vast our experiences are abroad, we are still away from our home. So, I always appreciate when people whether from business or personal are there to extend a warm welcome.